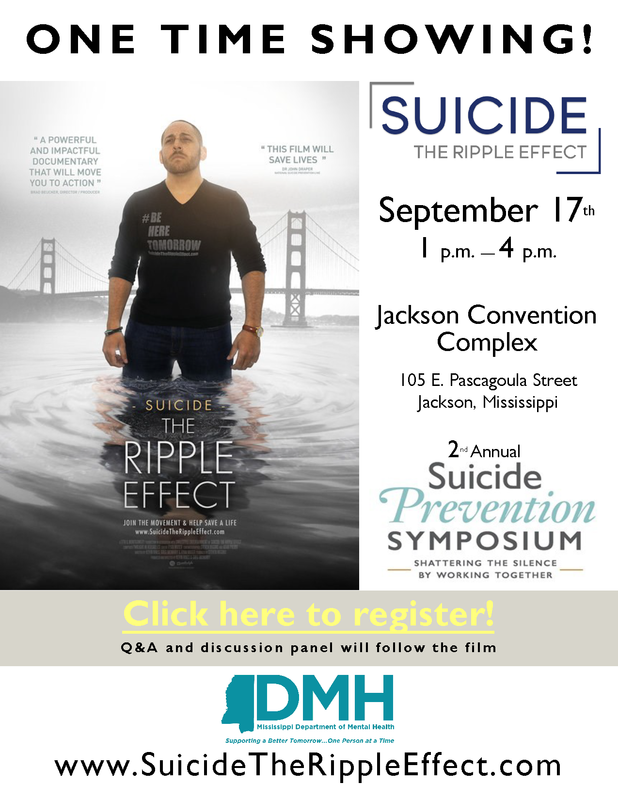 Join DMH on September 17, 2018 at 1 p.m. for a showing of “Suicide: The Ripple Effect,” a feature length documentary film and movement, focusing on the devastating effects of suicide and the tremendous positive ripple effects of advocacy, inspiration, and hope that are helping millions heal and stay alive. The film highlights the journey of Kevin Hines, who at age 19 attempted to take his life by jumping from the Golden Gate Bridge. Today Kevin is a world-renowned mental health advocate, motivational speaker and author who travels the globe spreading a message of hope, recovery, and wellness. The film chronicles Kevin’s personal journey and the ripple effect it has on those who have been impacted by his suicide attempt and his life’s work since. In addition, the film highlights the stories of individuals and families who are utilizing their personal tragedies to bring hope and healing to others. A panel discussion will follow the film. Admission is free, but all attendees must register by clicking here. Space is limited, so register now.